A 16th century German sect of Anabaptists led by Nicholas Storch who believed that all knowledge, even knowledge of the alphabet, prevents people from a true knowledge of God. Abecedarians believed that God would provide all necessary understanding through divine means such as visions and ecstatic experiences. According to them, all theology and “academic” learning amounted to an idolatrous abandonment of the Christian faith. Their name, Abecedarians, comes from their denial of the ABCs. 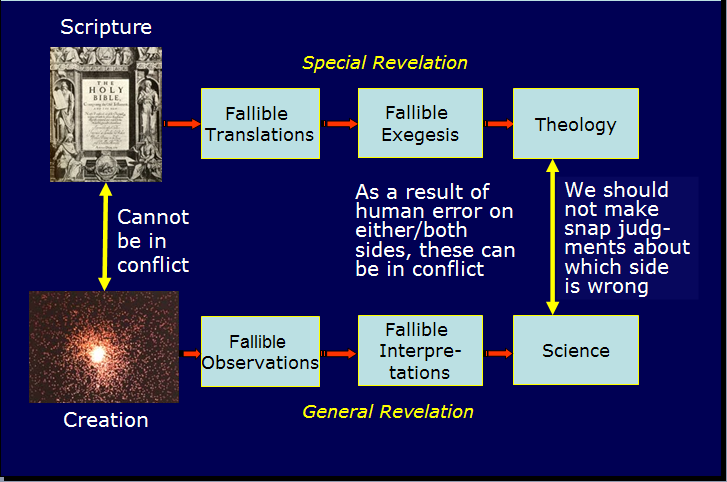 I found the following diagram helpful in understanding the tensions that sometimes exist between science and Biblical faith. The diagram distinguishes between: 1) Scripture and theology, and 2) creation and science. Scripture is God’s Word and therefore free from error. The physical creation is God’s work and therefore will never be in conflict with God’s word. However, theology is man’s study of Scripture, just as science is man’s study of creation. As such, theology and science are both susceptible to error and can be in conflict with each other. Thus when science and theology conflict, we should not rush to judgment about which side is wrong. Rather we should continue to test our theology against the evidence of Scripture and our science against the evidence of the physical world. When we get our theology and science correct, there will be no conflict between the two. 3) the value of both theological and scientific endeavor. Note: The diagram comes from David Heddle, associate professor of physics at Christopher Newport University. Heddle is currently teaching a Sunday School class on science and faith at Grace Baptist Chapel in Hampton, VA. He is posting his weekly notes online at GBC Sunday School. You can find an outline of the series here. Albert Mohler describes the process of theological triage in part two of his article: The Pastor as Theologian. The pastor must learn to discern different levels of theological importance. First-order doctrines are those that are fundamental and essential to the Christian faith. The pastor’s theological instincts should seize upon any compromise on doctrines such as the full deity and humanity of Christ, the doctrine of the Trinity, the doctrine of atonement, and essentials such as justification by faith alone. Where such doctrines are compromised, the Christian faith falls. When a pastor hears an assertion that Christ’s bodily resurrection from the dead is not a necessary doctrine, he must respond with a theological instinct that is based in the fact that such a denial is tantamount to a rejection of the Gospel itself. Second-order doctrines are those which are essential to church life and necessary for the ordering of the local church, but which, in themselves, do not define the Gospel. That is to say, one may detect an error in a doctrine at this level and still acknowledge that the person in error remains a believing Christian. Nevertheless, such doctrines are directly related to how the church is organized and its ministry is fulfilled. Doctrines found at this level include those most closely related to ecclesiology and the architecture of theological systems. Calvinists and Arminians may disagree concerning a number of vital and urgently important doctrines–or, at the very least, the best way to understand and express these doctrines. Yet, both can acknowledge each other as genuine Christians. At the same time, these differences can become so acute that it is difficult to function together in the local congregation over such an expansive theological difference. I find this three-fold distinction helpful. How about you? Wells argues that the historic, classical evangelicalism is one marked by doctrinal seriousness, as opposed to the new movements of the marketing church and the emergent church. He energetically confronts the marketing communities and what he terms their “sermons-from-a-barstool and parking lots and apres-worship Starbucks stands.” He also takes issue with the most popular evangelical movement in recent years – the emergent church. Emergents are postmodern and postconservative and postfoundational, embracing a less absolute, understanding of the authority of Scripture than Wells maintains is required. D. A. Carson applies his masterful touch to this problem. He begins by exploring the classic typology of H. Richard Niebuhr and his five options for understanding culture. Carson proposes that these disparate options are in reality one still larger vision. Using the Bible’s own story line and the categories of biblical theology, he attempts to work out what that unifying vision is. Combines three classic articles by Packer—””The Heart of the Gospel”; his Tyndale Biblical Theology Lecture, “What Did the Cross Achieve”; and his introductory essay to John Owen’s The Death of Death in the Death of Christ—with Dever’s recent article, “Nothing but the Blood.” An important anthology that reaffirms the classic doctrine of substitutionary atonement and counters the ongoing attacks against it. Throughout the movie, the groundhog seems to function as Phil’s nonhuman doppelganger. Both are weathermen and they share the same name. Phil suspects a link but wrongly concludes that as long as Phil the groundhog sees his shadow, he will be doomed to relive February 2nd. (This initiates a tragicomic incident in which he kills himself and the groundhog.) But what we eventually come to realize is that it is not Phil the groundhog’s shadow that proves crucial, it is Phil the man’s. As long as Phil wakes up in the morning and sees his shadow, there will be for him more winter, more of the same. But if he awakes without a shadow, he will be given spring, new life. What is Phil Connors’s “shadow”? It is his vices, his bad habits and sinful ways that detract from and diminish his God-given goodness. The equation of shadow with vice is apposite, since both are, in St. Augustine’s terms, a privation: Shadows are a privation of light, and evil and vice are a privation of the good. Significantly, when one of the townies hears Phil Connors’s name, he teases him with the admonition, “Watch out for your shadow there, pal!” And significantly, the townie’s name is Gus—short, of course, for Augustine. Great stuff! If you enjoy this movie, definitely check the whole article out. Why are we so unfamiliar with them? Why are they important for us to study and learn? 1) We need the prophets to help balance out our unbiblical views of God. We ended yesterday by talking about the messages of judgment that the prophets brought. And yet we saw that they also spoke words of comfort and hope. People often say things like, “The Bible says God is love. He doesn’t judge people.” But the same Bible that tells us that God is love also tells us that God judges and punishes sin. God is both loving and just. The prophets help us to develop a fully biblical picture of God. 2) The prophets deal with the weighty issues of life. The prophets deal with the weighty issues of life – things like God’s character, God’s uniqueness, God’s sovereignty over the nations, God’s requirements for his people, the importance of justice and righteousness. Without the prophets our faith can grow shallow and weak, unable to stand up to the rigors and challenges of life. 3) The prophets point us to Jesus as the Messiah. The whole Old Testament points forward to the coming of Christ, but as the time drew nearer, the prophetical books became more and more specific about the coming of the Messiah who would bring salvation for all the nations. Some of the most startling and clear prophecies of Christ in the Old Testament are found in the prophets. 4) The prophets help us understand God’s plan for the ages. Without the prophets we could never make sense of what happened to Israel as God’s people. We would not understand God’s plan for his church in the present age. The prophets are critical for understanding God’s plan for the ages, including our own future. Next week I will begin blogging through the Old Testament book of Habakkuk. Habakkuk is one of the Minor Prophets. It is a short book with a powerful message for today. I hope you will take advantage of this opportunity to practice “reading the prophets” with me. A third reason is history. Reading the prophets requires an understanding of the historical events that took place at the time of their writing. The prophetical books take place largely during the time of the kings of Israel, the exile, and Israel’s return from exile. If you are not sure what I mean by the kings, or the exile, or the return from exile, that is exactly my point. When we don’t know the historical context behind the book, it is difficult to understand what the prophet is saying. And in fact, the prophets take in more than just the history of Israel during this time, but also interact with the history of many of the surrounding nations as well. This is why it is very helpful to have a good commentary on hand when you are reading through the prophets. And then there is a fourth reason why we are not as familiar with the prophets, and that has to do with theology. The prophets present many messages of doom and judgment. That was one of their functions. We don’t like to think about God as a God of judgment. We like to think of God as a nice God who forgives everybody. And so people often have trouble relating to God’s judgments in the prophets. Let me say something about that for a moment. God does not change from book to book in the Bible, or even from testament to testament. He is the same everywhere. You do not find a different God in the Old Testament than you do in the New Testament. 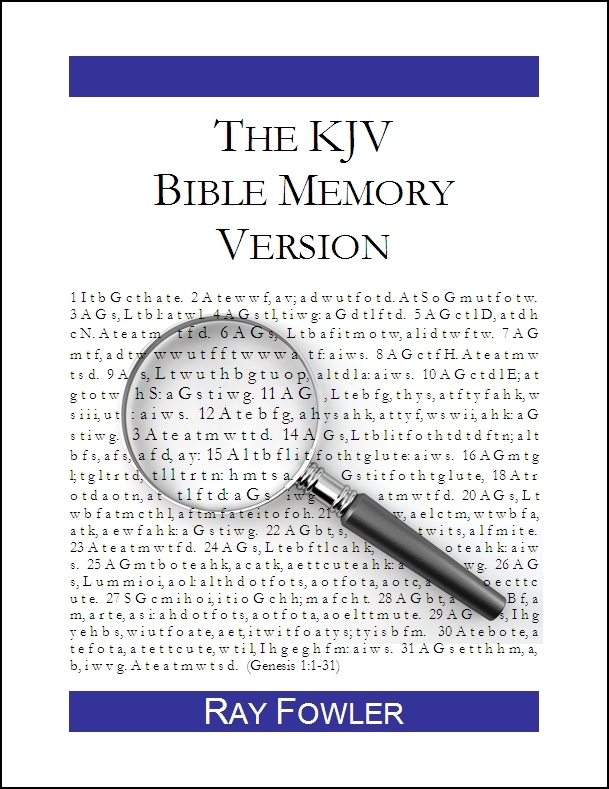 You find passages relating to God’s judgment in all the various parts of the Bible, both Old Testament and New. And you find passages relating to God’s love, mercy and forgiveness in all parts of the Bible, both Old Testament and New. In fact some of the most beautiful and profound passages in Scripture describing God’s love and mercy are found in the Old Testament prophets. It is not a matter of different pictures of God being presented, but different emphases. The prophets were sent for a very specific purpose. They were sent to warn Israel and the surrounding nations of God’s coming judgment for sin and idolatry in hopes that they would turn from their sins and thus avoid judgment. Sadly they did not, and so God’s judgment fell in full force upon them. This leads us directly into our second question about the prophets. Why are the prophets important for us to study and learn? More on that tomorrow!